And, if luck and changing laws cooperate, they’ll be drug barons of a certain kind. Kennedy, 40, and Blue, 34, are in the vanguard springing up to seize the market for legal marijuana, which is accelerating with last fall’s legalization of most personal pot consumption in Colorado and Washington state. They’re running a Seattle private-equity fund, Privateer Holdings, designed to buy up the smaller marijuana-related businesses to create one bigfat one. After Washington and Colorado, the pot business is, if not mainstream, at least ready to push toward it. Advocates hope to legalize personal use in another 14 states by 2017, mostly among the 16 states besides Washington and Colorado where medical pot is legal (it’s also legal in Washington, D.C.). Industry estimates say today’s $1.5 billion legal market could quadruple by 2018. The public is trending toward legalization. 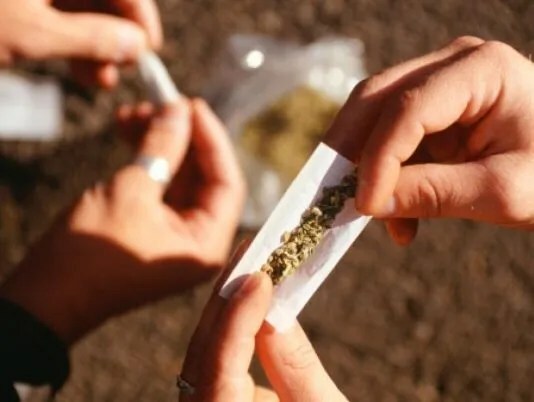 In a Pew Research Center poll released Thursday, a majority of Americans (52%) favored legalization, the first time that threshold has been reached since polling on the issue began in 1969. Just don’t say that word to Kennedy, unless you want him to blush. Scratch the term “growing the business” — he catches that one in midsentence, correcting his wording to “expand.” And forget weed, ganja or pot. He uses the scientific term, cannabis. And the cannabis business is good, he says. Jokes aside, the striking thing about the new gold rush in pot is how familiar it sounds to people used to the technology business. Just like Silicon Valley entrepreneurs, start-up pot investors such as Kennedy, Blue and ArcView CEO Troy Dayton — whose company runs an angel-investor network matching companies with rich activists — talk about how big and fragmented the market is, and how the relative handful of legal businesses out there lack the leadership and tools they need to (sorry, Mr. Kennedy) grow the industry. That leaves the field open for people who can bring capital and experience, they say. That part is true. The best way to estimate the potential size of the legal market for cannabis begins with the illegal market — which is somewhere north of $18 billion a year in pot Americans consume already, said Harvard economist Jeffrey Miron. The trade journal Medical Marijuana Business Daily says the $1.5 billion legal market could reach $6 billion by 2018. The challenges are myriad. Some are specific to selling a product still illegal in most states. But others are very ordinary, thanks partly to the business’ Bohemian roots. It’s hard to say exactly how many people are trying to make pot a business like any other. About 2,000 legal dispensaries are open around the United States, estimates Kris Krane, managing director of Phoenix-based consulting firm 4Front Advisors. Privateer and Dayton’s group are the biggest publicly announced clusters of investors. There are even a handful of public companies: The most valuable, San Diego-based Medical Marijuana, is worth about $200 million. Increasingly, the cultural overlap between the pot business and just plain business is occurring because they’re attracting the same people. Adam Wiggins, a member of Dayton’s investor network, sold software-as-a-service company Heroku to Salesforce.com for $250 million. Alan Valdes, chairman of Seattle-based Diego Pellicer — which plans 24 upscale marijuana shops as the anchor of what he hopes will become a Harley-Davidson-like lifestyle brand — is director of stock-exchange-floor operations for DME Securities. He appears sometimes on CNBC, talking about stocks. Kennedy, meanwhile, came from Silicon Valley Bank. Others involved still have an eye on the politics of the industry, as well as the economics. Dayton, for example, was chief fundraiser for the pro-legalization Marijuana Policy Project until 2010. Wiggins, who’s on MPP’s board, said they’re not mutually exclusive. “Almost any software you can think of is made by someone who enjoys a toke,” he said. Even so, selling pot is a federal crime — something that seeps into business conversations like smoke wafting under bedroom doors. Many investors, including Privateer, plan to cut their risk by not buying and selling marijuana itself, Kennedy and Dayton said. MJ Freeway Software Solutions helps pot-dispensary owners document supply chains once considered evidence of conspiracies, while Krane advises them on how to adapt best practices on prosaic issues such as store design and human resources policy from top retailers like Old Navy. Privateer’s first buy was Leafly, a Yelp-like website and mobile app that reviews 500-plus strains of cannabis, luring 2.3 million monthly visitors. The heavy traffic has allowed Leafly to begin selling ads. Several help pot entrepreneurs who can’t otherwise buy insurance because most insurers think their businesses are too risky, said Patrick McManamon, managing director of Cleveland agency Cannassure. The people at the most legal risk, Kennedy and Blue reason, are marijuana dispensary owners, because the federal government could raid the stores and confiscate the investment. That stance may represent an abundance of caution: President Obama, whose memoir paints him as a regular pot smoker in his high school days, said in December that prosecutors have “bigger fish to fry” than recreational pot users. “We’ve never seen a consulting firm become a target,” said Krane. Citing a 2009 Department of Justice memo that said federal prosecutors shouldn’t use resources to pursue marijuana businesses clearly complying with state law, he said he should be safe if he only serves clients licensed in their home states. But a different DOJ memo in 2011 said large-scale pot growing, even for medical marijuana shops, is still illegal, even when federal law allows it. Attorney General Eric Holder told a Senate committee last month that the department is still working on its response to Colorado’s and Washington’s new laws. For Amy Poinsett and Jessica Billingsley, who run Denver-based MJ Freeway, helping store owners keep track of valuable product from field through the cash register is a valid software market: They sell to about 400 legal stores in the 16 medical-marijuana states, making their 2-year-old company profitable. Wiggins was impressed enough to agree to invest in MJ this year. Its software illustrates that pot markets will behave like other markets — they’ll get more capital-intensive, more concentrated and more professional, assuming legalization spreads, he said. Nothing about the rapid growth of marijuana markets, or even the hands-off-the-pot business strategy, is an automatic winner. Clearly, the feds could cripple the business. Even the strategy of profiting from marijuana without touching it could run afoul of money-laundering laws, if those services are bought with drug proceeds, said UCLA professor Mark A.R. Kleiman, who is advising Washington’s liquor board on regulating legal pot stores. There’s also a good chance that a legal pot market won’t expand consumption as much as entrepreneurs think, Miron said. Colorado and California have already seen a sharp consolidation of medical-marijuana shops opened by people who thought the market would take off faster. A referendum on the ballot in Los Angeles in May would limit the number of medical-marijuana shops to 135 that opened by 2007. Careful regulation could also hurt a business that, like the alcohol industry, stands to make most of its profits from the few people who consume too much, Kleiman said.